"Nothing is more stunning at the dinner table than serving a whole fried fish with a fragrant unctuous sauce. Caution should be used when deep frying the fish; make sure you have plenty of room and a big pot. Serve with steamed jasmine rice." Heat 1 quart oil in a deep-fryer or large saucepan to 350 degrees F (175 degrees C). If you do not have a thermometer, then dip the head of the fish into the oil; if it sizzles, it is ready, if it does not sizzle, then wait a couple minutes and try again. Rinse the fish and dry well. Make several angled slits along the body of the fish, cutting down to the rib bones. Make two lateral slits along the back of the fish, from head to tail, on either side of the dorsal fin. These cuts will ensure quick cooking and maximum crispiness. Gently slip the fish into the oil and fry until crispy, 7 to 10 minutes. Carefully remove the fish from the oil and let it drain on paper towels. Place on a large serving platter. While the fish drains, heat 2 tablespoons oil in a large skillet. Cook and stir the chili peppers, garlic, and onion in the hot oil until lightly browned, 5 to 7 minutes. Stir the fish sauce and soy sauce into the mixture, remove from heat, and fold the Thai basil and cilantro into the mixture. Pour the sauce over the fish to serve. Much better grilled and just as "stunning at the dinner table". Fried.... Very Unhealthy. Sauce is tasty, tasty. The fish was delicious and crispy. Make sure you ease back on the soy sauce if you are using regular instead of light. 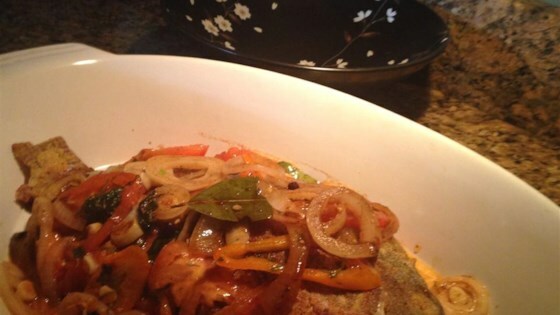 I used croaker instead of tilapia and added oyster and Asian chili sauce to kick up the flavor. Great taste!